Today was the 2nd points event for Renegade Miata! Dave is looking to get that 1st place jacket at the end of the year from SCCA just as bad as I am, so he decided to come out for some extra seat time. We decided to switch it up a little bit this event however. Thanks to Rob (chairman of the Renegade Miata Club), he allowed Dave and I to do a test in the morning. We were going to switch cars and compare the differences in our two cars with their current build, and how well we could adapt to them. This would be a great opportunity to focus on being smooth on the course while being in another RX-8 that is setup differently. In the afternoon, we then would switch back to our own cars and see if we could beat our times in the morning! This would really allow us to critique our own cars, as well as each others and consider making changes if need be. This is the first, in hopefully many more to come, "BSP VS. STX Battle"! I decided that I will be running the rest of Renegade Miata on street tires so that my Hoosiers can stay as top notch as possible, (and to be fair for this test/battle). 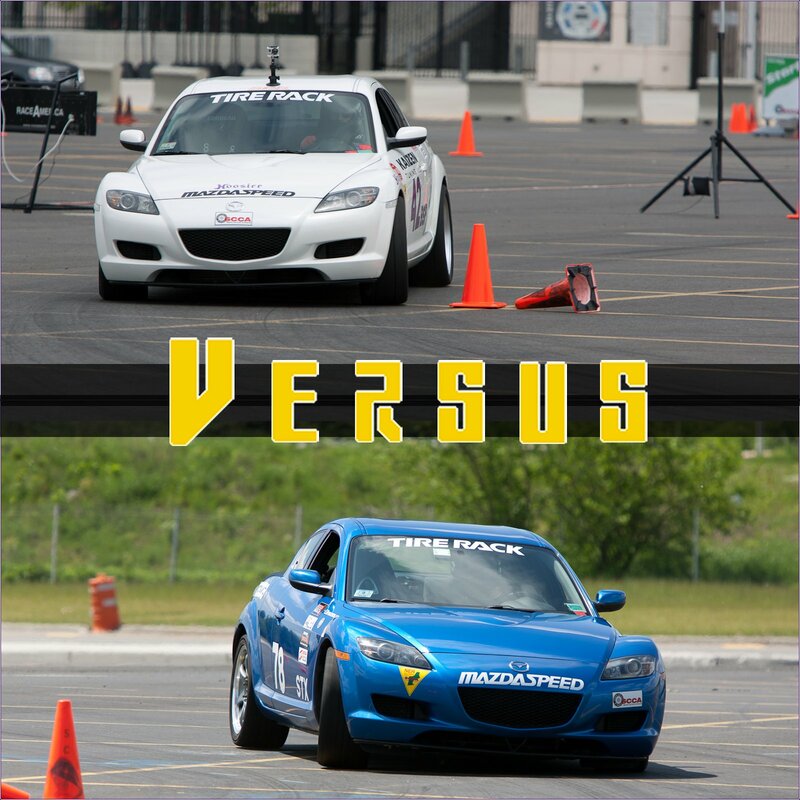 There are not too many differences between Dave's RX-8 and my own RX-8. The biggest differences would have to be that I have the BHR midpipe, flywheel, 4.777 rear end, very different spring rates (730 lb. and 450 lb. versus 503 lb. and 337 lb. ), and 255/35 Dunlop Star Specs as opposed to 265/35 Yokohama Advan AD-08. The course was very tricky and had a very interesting rhythm to it, emphasizing heavily on being consistently smooth. The battle in the morning was interesting to say the least, where as I was enjoying Dave's car and putting down quick times, making only minor adjustments, and Dave was fighting with my car to keep it stable and put the power down when exiting the turns. I helped Dave by adjusting the shocks and playing with tire pressures, getting it down to full soft in the rear, 12 clicks from stiff in the front, and 29 PSI in the front with 30 PSI in the rear. A very different setup compared to when I run R compounds. 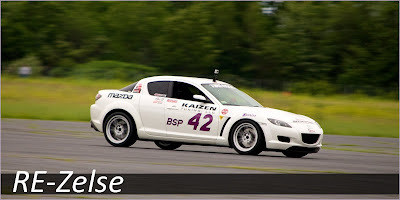 Next event I think I may actually benefit with the rear swaybar removed, so I will try that out and see how it goes. My fastest run in the morning was a 1'21 clean, with Dave getting a 1'19 very dirty, and then a 1'22 as his fastest. In the afternoon when we switched back, I was much more at home, and so was Dave. I was able to get down to a 1'20 clean, but with a fastest of 1'19 dirty. Dave was right behind me with a 1'20. 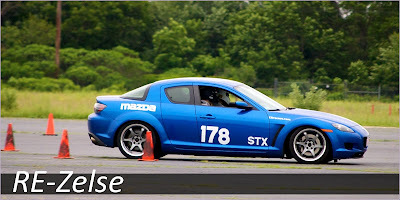 I think we both could've gone faster if we had more practice in our own cars in the morning, but I was happy with the overall test and am looking forward to the next SCCA NER race. As always, results for Renegade Miata are located here. Thanks Dave for the test, I had a lot of fun and am looking forward to our next swap or comparison battle. Below are our fastest runs in the morning and afternoon. Until then, I will be filling my motor mounts with polyurethane because it felt AMAZING in Dave's RX-8, so stay tuned!